Jamie Glazov interviews Robert Spencer for FrontPage Magazine, on Spencer’s new book, The Complete Infidel’s Guide to the Koran (Amazon link). Spencer: Political correctness would have us believe that the Koran is a book of peace, and that anyone who says otherwise is “bigoted,” “hateful,” and “Islamophobic.” But is it, really? What the Koran really says can easily be verified. If the Koran really curses Jews and Christians (9:30) and calls for warfare against them in order to bring about their subjugation (9:29), it is not “Islamophobic” to forewarn Infidels by pointing this out. It is simply a fact. And it should go without saying that it is not a fact that should move any reader of my book to hate anyone. The fact that the Koran counsels warfare against unbelievers should move readers to act in defense of freedom of speech, freedom of conscience, and the legal equality of all people, before it is too late. But most government and media analysts dare not even question the assumption that the Koran is peaceful, for they believe that any insinuation to the contrary is racist, bigoted, and effectively brands all Muslims as terrorists. In other words, they think the implications of the possibility that the Koran teaches warfare against unbelievers are too terrible to even contemplate. Thus, many policymakers simply assume the Koran teaches peace without bothering to study the text. They do this to their own peril — and ours. Democracy = mob rules. Republic = rule of law. Keep this in mind when American politicians–of any stripe–talk about the “will of the people”. This is worth ten minutes of your time if you’ve forgotten–or never got–this lesson in civics class. Raena tagged me. Normally, I’d politely ignore it, but I must give her props for the way she linked to me. 3. Tag EIGHT people at the end of your post and list their names. 1. I have never tried Vietnamese food, nor do I plan to. Seriously, it’s like pulling teeth to get me to try non-rice-based Chinese or Thai dishes, so I’m not really interested in trying pho-anything. Noodles should be a form of pasta, covered with marinara or alfredo sauce. 2. I utterly detest the song “You Light Up My Life”. Made popular by Debby Boone in the late 1970s, this was one of the songs we were forced to sing as a collective choir in fifth-grade as a tribute to our parents during the incredibly lame fifth-grade “graduation” ceremony we were equally forced to participate in. While I sincerely am thankful to my parents for all they have ever done for me, the repeated practices of this song burned it so deeply in to my brain, that even now, as I type this, I can hear Ms. Boone’s voice coming over the jambox we used to listen to the words and music, and I cringe in abject horror. 4. I have been a pallbearer in a military funeral. My sophomore year in college, one of my best friends was killed by a drunk driver. We were in Air Force ROTC together, and Brett’s fondest dream had been to be a navigator for the United States Air Force. It probably wasn’t as pretty, or as crisp, as a military funeral one would get if they were actively serving, but Brett got full honors, it was the best we could do, and it was from the heart. 6. I have met Michael Jordan and Oliver North. Jordan participated in a basketball clinic at the convention center I worked at (see item #3), and I was part of the staff assigned to show him around behind the scenes. No, I did not get his autograph, or a photo with him. The man had been at a charity golf tournament earlier in the day, and was clearly tired from that and the other events he’d participated in while in town. But he lit up when he saw the kids. Colonel North was doing a book signing at an area book store, and I got my copy autographed. 7. I have never been drunk. I’m not kidding. Not lying. Never been drunk. Don’t plan to be, either. 8. I don’t really listen to the radio any more, nor do I watch television news. (Yes, I’m kind of stealing this one from Raena.) Between the music I rip from CDs and download from Amazon or the iTunes Store, and podcasts, I have no reason to listen to the radio, other than traffic updates. I get my news online. Two weeks later, some more skating fun! The little phisch got better moving around the house without help, but seemed to regress when it came to getting up when he fell. Click the photo to see the entire set. 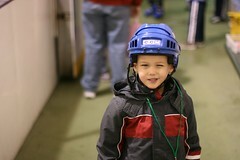 Whenever he’s been asked what sports he wants to play, our son has been consistent: “Baseball and hockey!” The first skill required in hockey is the ability to ice skate, so with that in mind, we enrolled him in ice skating lessons earlier in the year. 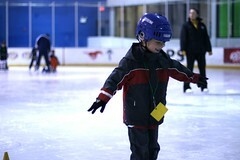 Of course, Dad had to take photos of the first lesson! Click on the photo to see the entire set. Thanks to our friends Brent and Tracy, I was able to go with Brent this past Friday to see Rob Bell on his The Gods Aren’t Angry Tour. I’d never heard Bell, and while I have one of his books, I confess I’ve yet to crack the cover, so I was looking forward to hearing what Mr. Bell might have to say. I was not disappointed. Brent has a thorough review, and I’m pretty much a “ditto” with what he says, so be sure to check it out. I will add a few comments and observations to those made by Brent. I noted how, when Bell was talking about how God changed the entire dynamic of the relationship with humans starting with Abraham, Rob noted how God, “used those other gods, worshipped by the rest of human civilization, as props in His narrative to humanity.” I’m not sure why that line jumped out at me, but it made enough of an impression to get copied into my Moleskine. Maybe it was just a reminder of how big God truly is, that He exists outside time and space as we understand them, and doesn’t display the very humanistic characteristics we see in the gods of the ancient civilizations. What’s also fascinating is how so much of what transpired, from a spiritual/faith standpoint, in the ancient world still pervades our so-called modern society. Looking at the religions of the world, all of them are still engaged in some sort of “doing” relationship. You have to do this to please Allah, you have to pray at a certain time, facing a certain way, saying certain words. If you sin, you must confess to the priest, and do penance as he directs. If you offend your neighbor, this is the ritual the rabbi can help you with to make things right. It’s all about doing, which is just how the ancients engaged with Apollo, Jupiter, or whoever. Christianity is unique in that God Himself provided the means of salvation, saying “Done!” The only thing required of you is to say yes to Him. That’s it. Everything that follows is from your relationship with Him, not because there’s anything you have to do, rather there are things that, as a result of the relationship, you want to do. Which was part of what Bell was getting at, too: the God of Abraham is unique in that He reaches out to humanity for a one-on-one relationship with each man, woman, and child. This idea floored the ancients. It would’ve been as radical a concept as showing a modern automobile to the Founding Fathers. Bell’s still on tour until December 2d, so if you’re in and around Raleigh, DC, Pittsburgh, NYC, Philly, Beantown, Louisville, Indy, or Rob’s home town of Grand Rapids, I highly encourage you to take it in. I don’t think you’ll be disappointed. My sister’s responsible for a big ball of learning? The McWane Science Center in Birmingham, Alabama, is getting a cool new invention, courtesy of the National Oceanic & Atmospheric Administration. My little sister wrote the grant application that landed McWane the exhibit. Way to go, sis!